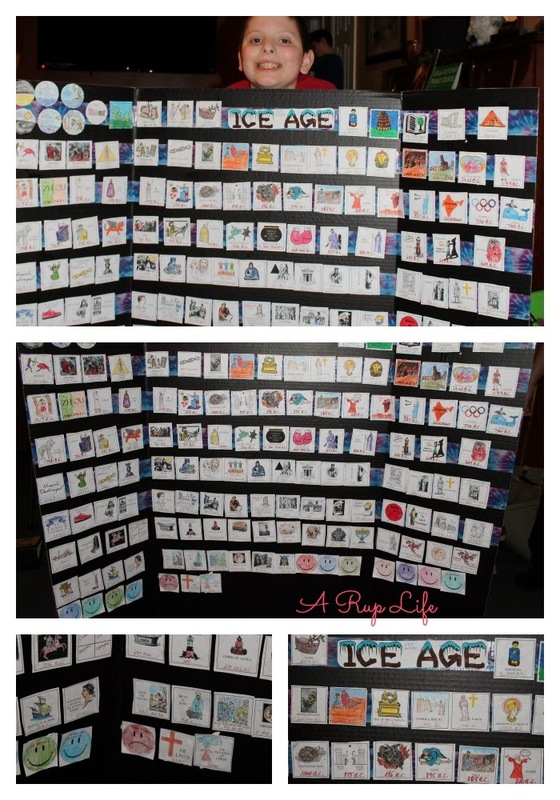 A RUP LIFE: The Mystery of History - Finished, Timeline and Final Thoughts! The Mystery of History - Finished, Timeline and Final Thoughts! Each week has a manilla file folder with the week written on it. Inside is each lesson's notebooking pages, pretest, activities, quizzes/test. On the outside I write anything additional I need (a book from our shelf, map pages, craft supplies). I pull each folder out when we start that week and I'm good to go. I don't get tied down to physical weeks but just keep trodding along. So we may do two folders in a single week or just finish one. It really helped me to have everything printed for the whole year so I wasn't looking for supplies. (same with supplemental readings - I just ended up buying the few I wanted so I didn't have to make a trip to the library for a book on Egyptians or Greek gods. One other thing we bought was timeline figures from Confessions of a Homeschooler - they were $5 and it was a inexpensive purchase. I really loved this program. In the afternoon we would sit around the living room (kids with tv trays and notebooks) and I would read the lesson. Then we would talk about it and do an activity. We all learned so much and it was amazing to see how it related to what we were learning about in church. Our Pastor would mention someone in the bible and my kids would say on the ride home about how we learned about that person! I loved that they were connecting the two! We used the pretest as quizzes and did the quizzes that came along with the curriculum as well. This was just extra for them to catch on to the key persons/dates. Overall I was 100% pleased with the program! 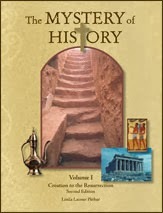 We start Mystery of History Volume II in January and I can't wait! You can read more about this program at TheMysteryofHistory.info! They have 3 volumes covering creation to the renaissance with a fourth volume due out next year!